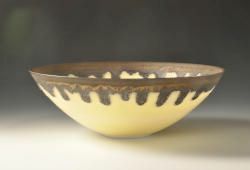 Small yellow and bronze porcelain bowl. 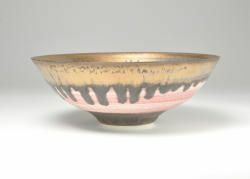 Small pink and bronze porcelain bowl. 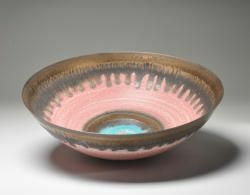 "Inspiration for me comes from simple things; pots from ancient China to modern Europe; the looseness, freedom and life of Bizen wares, the wonderful colours, textures and forms of Lucie Rie’s work; the inverted profile of a hat, a blackbird singing outside my bedroom window." 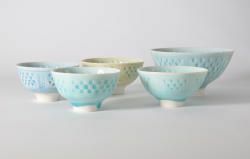 "I aim for balanced form, attention to detail and life; I would love the ability to produce pots of a calibre that would make people catch their breath – however, for now, if I can occasionally stir the heart, I’ll be content." Widely exhibited in Britain, my work has also been shown in Italy, Brussels, Spain, the Netherlands, Japan, the UAE, Germany, and the USA. Commissions are undertaken; the most prestigious to date being for HM Government, who presented pieces as gifts to nineteen visiting European Heads of State attending a Summit in Wales. 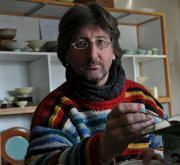 I am a member of South Wales Potters, and a Professional member of The Craft Potters Association of Great Britain.